When I was a young boy, I used to love taking walks with my dad and listen to the stories he would tell me about important events in his life. Dad would say, “Buddy, now listen carefully, because I want you to learn something from what I’m about to tell you.” I would say, “Yes sir, I’m listening”. On this occasion, dad told me about the time he and mom were driving through Tennessee in their green Chevy station wagon, on their way to Kansas to visit mom’s sister Trudy, when he started to get hungry. I wasn’t yet born. It was July, 1961 and my oldest sister Chandra, was only four months old. Chandra was the reason why dad and mom where in Tennessee and now on their way to Kansas; they were traveling to different states where their relatives lived to introduce them to the new member of the Taylor family. Dad spotted a Krystal’s restaurant on the side of the highway, pulled off the road and parked in front. Before I continue his story, I should let you know that my mom was born in Chattanooga Tennessee and understood the norms and behaviors of the south at that time, but my dad was born in Columbus Ohio and grew up in the north. The treatment of African Americans in the north was no bed of roses in 1961, but it wasn’t the south and there were things you could do in the north that you just couldn’t or shouldn’t do in the south. When dad pulled off the road and parked the car in front of the restaurant, mom immediately told dad that he was not supposed to park in the front, but on the side of the restaurant and go to the side window to place his order. Chef: What do you want! Dad: I want some hamburgers. Chef: Well, how many do you want! Chef: You want thirty hamburgers? Dad: Yes, I want 30 hamburgers. Chef: Well, stand over there against the wall! Dad stood against the wall and glanced out the window at mom who was still sitting in the car, holding Chandra, petrified with fear. He looked around the restaurant and every one was still frozen and quiet; they would look at the chef and at dad; they would glance back at the chef and then back at dad again; and this went on in silence for 10 heart pounding, terrifying, interminable minutes. Finally, when the chef was just about done fixing the burgers, dad looked at the chef and said, “I’ve changed my mind, I don’t want them” and walked out the door. When he got back to the car, mom looked at him and asked, “What happened?” Dad said to mom, “I told the chef to make me 30 hamburgers and when they were about done I just told him to keep’m.” Mom, then very firmly and emphatically said to dad, “If we don’t leave here right now and very, very fast, there’s a good chance they’re going to string you up on a tree”. They left the restaurant and made it to Kansas in about half the time that it should have taken to get there and they did not eat that day. When dad finished his story he said to me, “Now Buddy, what have you learned from my story?” To be quite honest, I didn’t know what to take from his story, so I just looked at him, dumbfounded. Then my dad with his very tall ominous stature, his big beady eyes and his low firm voice looked down at me very sternly, peered directly into my eyes and said, “Don’t you ever stand for anyone to treat you unequally and anything less than a man.” He paused and I held my breath, trembling in my shoes from the wisdom he just imparted, my eyes afraid to move from his. Then he smiled at me and said, “And always have a good exit strategy.” We both busted out laughing and continued our walk. 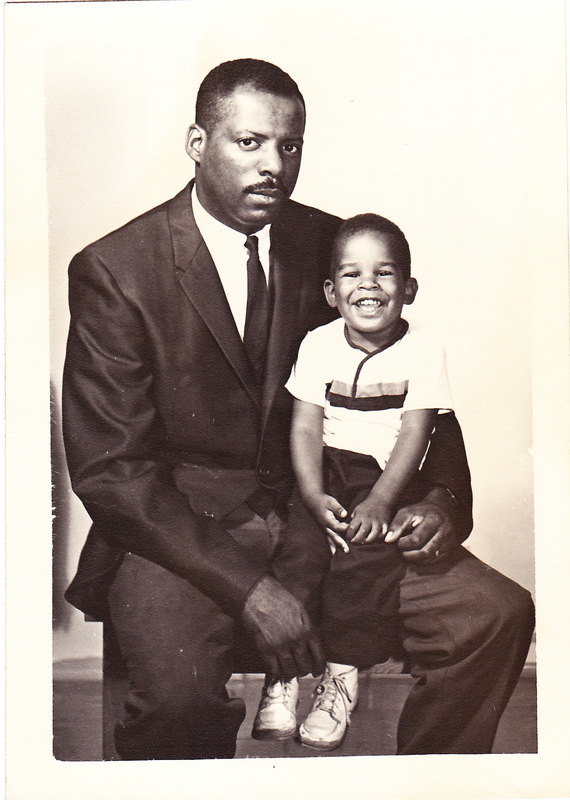 I’m remembering my dad, Rev Dr. Hycel B. Taylor Jr., today because he is no longer with me here in physical form though I know he is always with me in spirit. Dad made sure that in no uncertain terms I understood that as a father it is your solemn responsibility to make sure your kids absolutely have three things: a roof over their heads, clothes on their back and that they never go hungry. And if you should fail in any one of these responsibilities it was not because you didn’t do everything physically, mentally and spiritually within your power to meet that goal. And whether you succeed or sometimes stumble and fall short, never ever let them see you sweat; it is not their burden to bear; it is yours and yours alone. He also cautioned me this; if you meet these goals, if you supply your children with all of the things they need and many of the things they want and if you never let them see you sweat; they may not fully understand the sacrifices you have to make and the price you may personally have to pay on their behalf and they may not always appreciate what you have done for them. And when you inevitably fall from your pedestal, and on those special days when they may not remember you, if you have prepared the way for them to stand on their own two feet to survive in this world, it’s all the thanks you need. I did not know nor fully comprehend all of the challenges, sacrifices, struggles and the price that my dad paid for me and my two sisters to be our father; but we always had a roof over our heads, clothes on our backs, food in our stomach, all of the things we needed, many of the things we wanted and YES, I did take him for granted. Dad is my foundation; he is the reason why I am a successful man, a strong man and a loving father. I owe him everything and I did not say thank you to him enough. So, I’m going to say it to him now, even though I can’t see him and even though I can’t put my arms around him and hug him; I know he can hear me still. Dear dad, in your imperfections you were perfect. You are and will always be my father and I will always be your, proud, very grateful and loving son. Took every class i could from him, often the only white person in the room. In his class “Religion and Race” which he co-taught with Rev.Jesse Jackson, I wrote a paper on Racism and Feminism. He gave me a list of African-American women to interview. At the end of one of those interviews (wish i could remember who with) as I was driving home, I got very angry. These amazing people and many more had been absent, in geographically deliberate ways, from my life. And I mourned. The wisdom and strength i found in them went beyond any i had recieved from adults or friends as i grew up. Bluntly said, I wish they were friends of mine. When I told all this to your Dad, he was openly pleased. Please know for these and so many other reasons, he occupies a special place in my memory and in my soul. I have NEVER before or since heard anyone preach and reach like your Dad. Please accept my sympathy and grief.